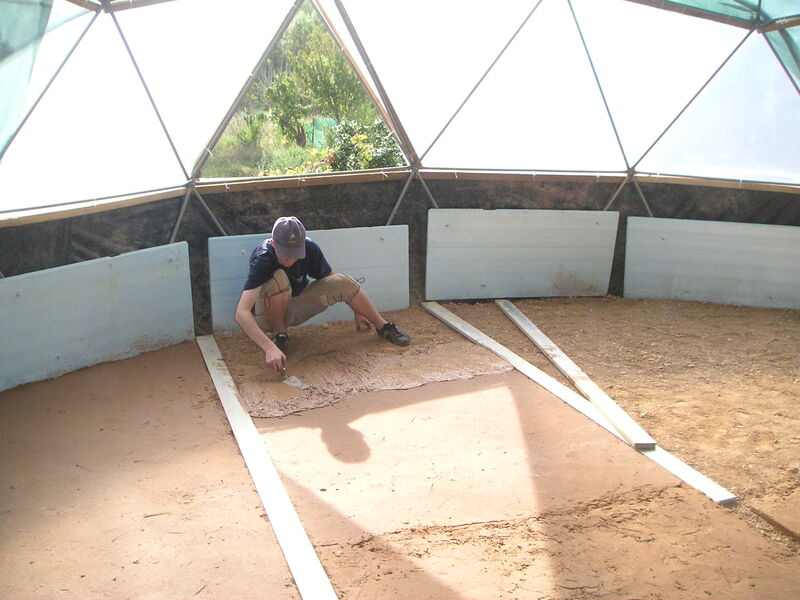 Meanwhile in the new dome, the floor plaster is now dry, solid and strong without any cracks so far, even after loading it with a heavy wooden structure that we built for storing materials. 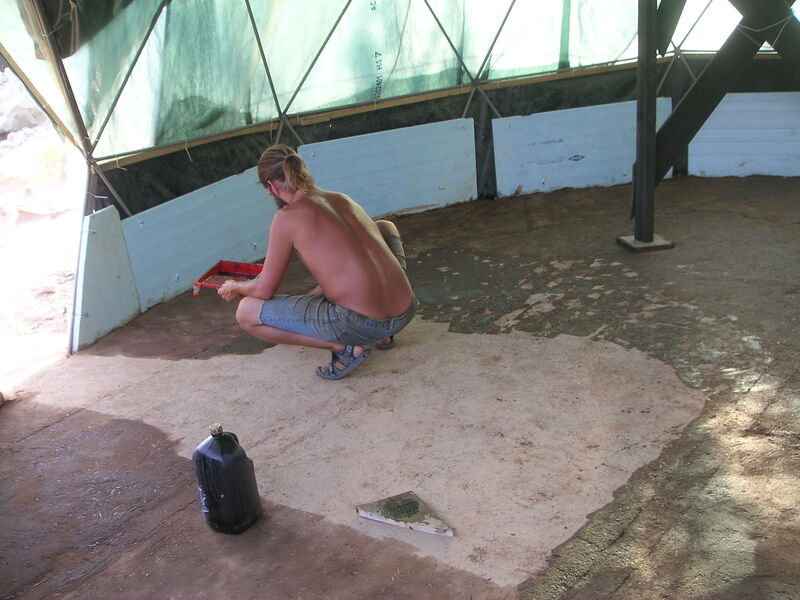 Adobe floors are often coated with linseed oil to seal and protect them from wear and tear. We mixed 10 percent pine tar in the first coat, to obtain a darker color. The antiseptic tar may also repel ants and other insects. Today Luisa and I had a meeting scheduled with Anabela, our contabilista (accountant) in Vila Nova de Milfontes, the holiday resort town on the Rio Mira estuary. We invited the construction team (Klavs and Narahari) to join us on this trip, for a day at the beach. After the meeting we drove on to a less crowded part of the Atlantic coast. Away from tourist centers are some beautiful large and quiet beaches, the access roads mainly known to locals. It is built of natural materials, like the one in China, but it doesn’t defend against invaders, only from erosion by the winter rains. The Great Wall of Osho Garden runs along the west side of the parking area, at the foot of the sound barrier between our land and the public road. Many volunteers have worked on it in the past and these days Narahari and Klavs are adding another long stretch to it. Rede sombra (shade net) is a green fabric used in agriculture to protect plants from the heat in summer by filtering 80% of the sun’s energy. We covered the new dome with this material, partly to protect the plastic foil, which has a lifetime of only a few years in full sunlight, and also to reduce the temperature inside. Now that the dome is dressed in it’s green jacket we can work inside, and the next step is to make a floor. After leveling and compacting the earth we are covering it with a mud consisting of natural and recyclable materials. It’s a mixture of 6 parts sand, 2 parts clay (sieved soil) and 1 part chopped hay. Narahari mixes it with water in the batoneira (cement mixer) and Klavs distributes it evenly and smoothly over the dome floor in a layer of about 2,5 cm thickness. Drying time is several days, even in this hot and dry weather. How many for Yoga today? This morning three of us were doing Yoga, with Ananda singing and playing the Kotamo lying down. Luisa had to leave early. We are with 5 these days. People sometimes ask me How many are living there? (see Questions) and are surprised when we are so few. Maybe because I always announce new arrivals in the blog and rarely mention departures. 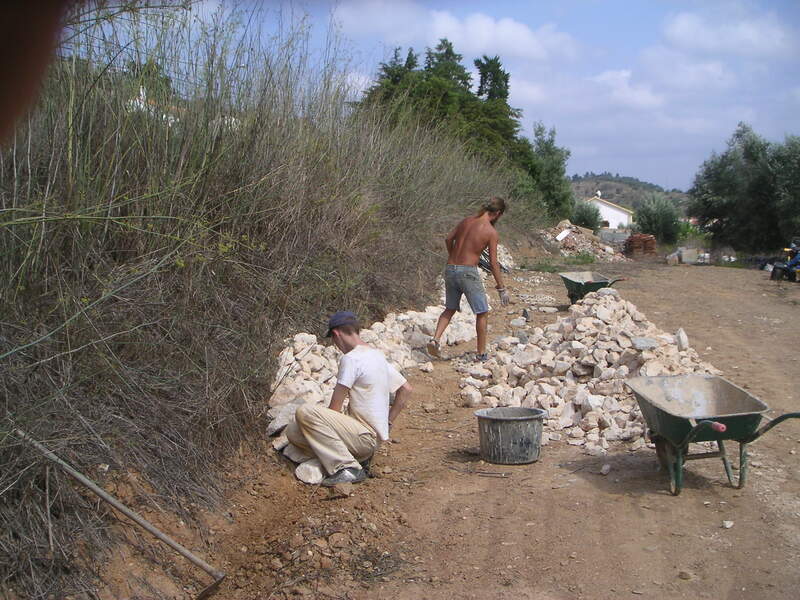 But unfortunately most people do return to their regular occupation after a few weeks. Not you? 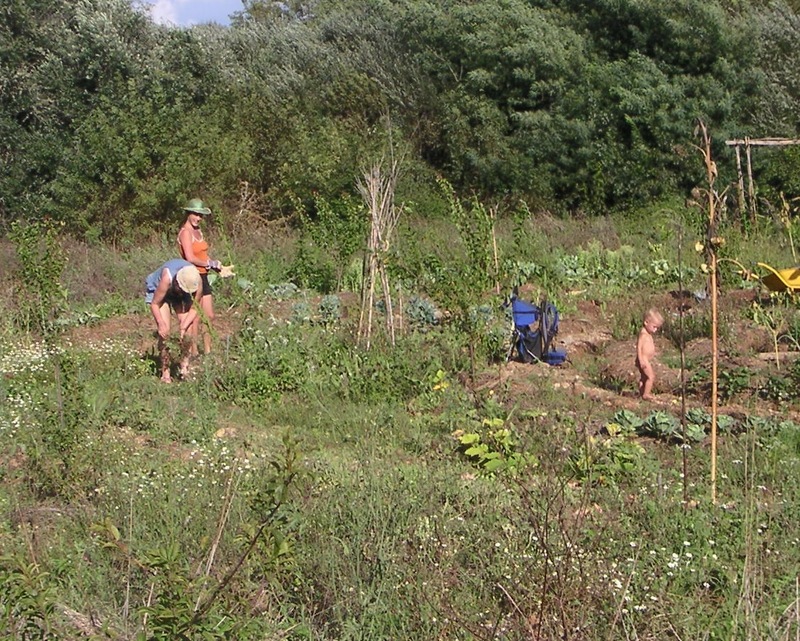 Their long prickly stems are a nuisance when they cross your path, they scratched some of our arms and legs today, so we decided to take cutting tools on the next visit to our land. But the taste of the ripe fruit – technically not a berry but an aggregate fruit – made it well again. In the picture, Klavs picking blackberries and behind him Narahari from Finland who arrived recently to join our project. 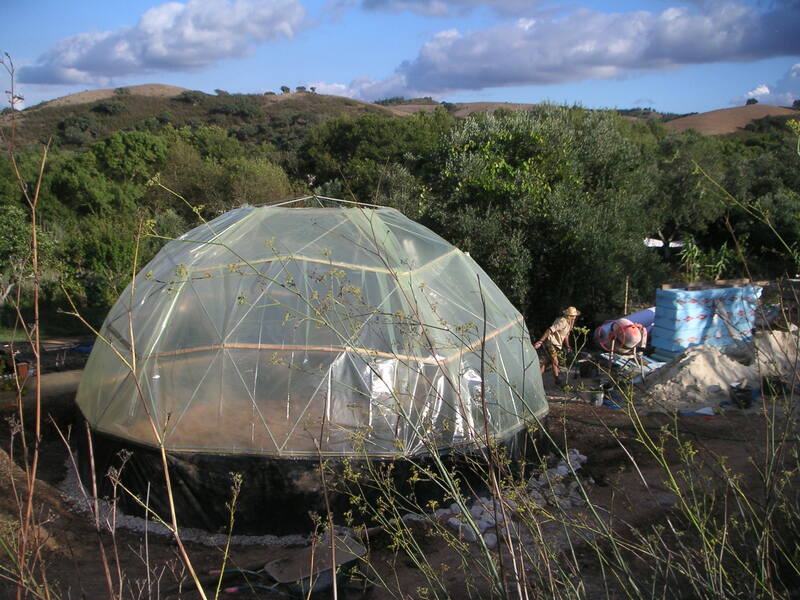 Estufas, usually cylindrically shaped greenhouses constructed of a frame of iron tubes with a covering of plastic foil, are common in this area. They protect crops from too much heat in summer and the heavy rains in winter. 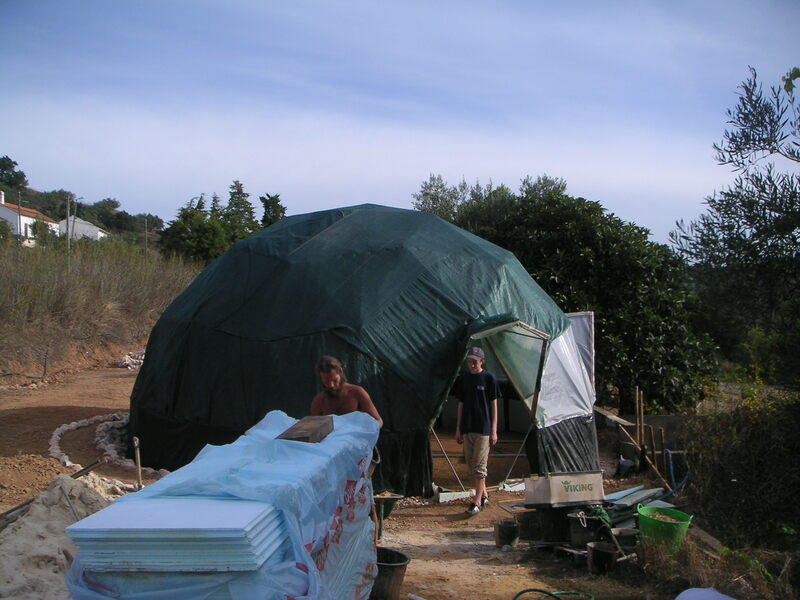 Our domes are spherical but otherwise constructed from the same materials. Today most of the foil covering was mounted, stapled onto wooden laths that are tie-wrapped to the tubes. Meanwhile in the garden a little Buddha was discovering our strawberry fields and the peppers, lettuce, tomatoes, honey melons and beans that we are harvesting now. He is the son of Kinga, a new participant from Hungary. Also part of Ananda’s gardening team today: Pragati from Holland who wants to discover communities. She transformed our produce into a delicious dinner.